Join British and International choirs for intensive tuition, massed choir rehearsals and sharing of experiences ending with a Gala public performance at the Queen Elizabeth Hall. This course will provide inspiration, repertoire enrichment, vocal and choral technique, confidence building, friendships and networking for choirs, choirmasters, individual choristers, and enthusiasts of all backgrounds. Final events of JMI Choral Festival with international and British choirs as well as massed male voices, mixed voices and children's voices. Visit Vienna between July 3rd and July 10th, 2005 - and combine the opportunity of attending some extraordinary concerts in the frame of the 2nd KlezMORE Festival Vienna with a possibility of meeting old (or new) friends! KlezMORE Festival Vienna 2005 is scheduled for July 3-10, 2005.
between West 4th and Bleecker Sts, Greenwich Village 1,9 Subway to Sheridan Square; A, C, E, B, D, F to West 4th St. The last few years there's been a surge of interest in the traditional music of Eastern Europe. Cornelia St. Cafe is celebrating all the different ways in which Klezmer and Gypsy traditions have worked themselves into the contemporary NYC music scene. The week-long festival includes Margot Leverett and the Klezmer Mountain Boys, showing that the blend of Shtetl Klezmer and Down Home Bluegrass is smoother than you would imagine; Jeff Perelman with members of Romashka, Village Klezmer and Max & Minka, drawing upon their own travels throughout the former Soviet bloc to bring you infectious Eastern European Klezmer music, Gypsy (Rom) music, Balkan music and more; Jay Vilnai's Vampire Suit, exploring the interconnections of Balkan music, Middle- Eastern grooves and improvisation; and Susan Watts, the youngest generation of an exciting klezmer dynasty that reaches back to the Jewish Ukraine of the 19th century, bringing a rich repertoire of many original songs written for weddings, family members and joyous occasions. Klezmer clarinetist Margot Leverett joins forces with today's stars of klezmer and bluegrass to explore the shared musical spirit of two genres literally worlds apart. Appalachian and southern fiddle tunes by Bill Monroe meet klezmer melodies from pre-war Russia and Eastern Europe, some newly discovered, and the resulting medleys and improvisations are at once raw, funny, melancholic and footstomping. 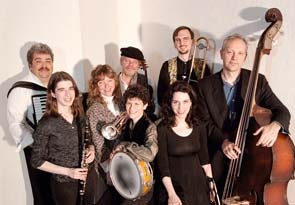 Their CD "Margot Leverett and the Klezmer Mountain Boys" was released to glowing reviews on Traditional Crossroads in September 2003 and has been used by the Paul Taylor Dance Company in their new piece "Klezmerbluegrass". Margot Leverett, clarinet, is one of the foremost clarinetists in the klezmer revival. A founding member of the Klezmatics in 1986, Margot went on to start a solo career with her pioneering CD “The Art of Klezmer Clarinetâ” on Traditional Crossroads. Critically acclaimed for her work on both clarinet and alto saxophone, Margot has performed and taught klezmer music at festivals and workshops around the world. Marty Confurius, bass, has appeared with virtually all the top people in both bluegrass and klezmer music. His credits include work with Vassar Clements, Bela Fleck, Jerry Douglas, Andy Statman, and klezmer legend Dave Tarras. Joe Selly, guitar has appeared with Phoebe Snow, Vassar Clements, Barbara Eden, Melissa Manchester,Tex Logan and the Lombardo Orchestra. He is featured on countless recordings and is in demand as both performer and instructor in bluegrass, jazz and swing. Kenny Kosek, fiddle has appeared with Jerry Garcia, John Denver, James Taylor, David Byrne, and his own Angelwood bluegrass band. He appears on numerous recordings, and has published dozens of instructional books. He is the bluegrass instructor for Homespun videos and is well known in Bluegrass, Irish, country western, rock and roll violin. Wednesday, July 6, 2005 at 5:30 P.M in the audtiorium of the YIVO Institute for Jewish Research, 15 East 16 St, New York, we will pay tribute to Eda Fasman Taub: the person, the writer, the cultural activist and friend. All her life, Eda tried to ensure, both spiritually and financially, the survival of Yiddish language, literature and culture. Without her help dozens of Yiddish books would have gone unpublished. Her ideals and memory live on in the generous legacy she left for the organizations whose goals she held near and dear. You are cordially invited. Admission Free. 88 Seventh Avenue b/w Bleeker & Grove St. These musicians have been bringing their infectious Eastern European grooves to weddings, cafes and dance clubs around NYC. Drawing upon their own travels throughout the former Soviet bloc, their performance will feature Klezmer music, Gypsy (Rom) music, Balkan music and an exploration of the common ground in between. If you happen to find yourself in or near Boston's South Shore in beautiful downtown Quincy, MA (named for our Presidential family) at the above time, you can hear di bostoner klezmer for free at the public library - outdoors if the weather is nice, indoors, otherwise. Golem on the Upper West Side! On Thursday, July 7th, New York's acclaimed klezmer-rock-yiddish-balkan-gypsy-slavic-stoner-mock-wedding band (oops, just kidding about one of those!) will perform at the Upper West Side's premiere JCC on Amsterdam and 76th Street. The JCC, 334 Amsterdam Ave. at 76th St.
Back in the 30's and 40's bluesy, comedic, swing musicians like Louie Jordan and Cab Calloway made some great music that still sounds fresh today. Yiddish was a pretty active street language in New York City at that time, and it was woven into the music. You had Slim Gaillard singing "Matzo Balls", Mildred Bailey recording "A Bee Gezindt", and Calloway's hysterical yiddish/ gibberish cantillation intro to "Ot Azoy" (That's the Way). Paul Shapiro celebrates this interplay of 40's hipster swing with some Yiddish thrown in at the Cornelia Street Café. Calling it the Ribs and Brisket Revue*, the saxophonist/composer features Babi Floyd, (of Keith Richard's Expensive Winos et al) and Cilla Owens (one of New York's best kept secrets). They will be backed by musicians from Paul's CD "Midnight Minyan", on Tzadik Records, which was released last year. An explosive mash of Romanian Gypsy melodies, punk frenzy, salty tangos, hard rocking klezmer, haunting Balkan harmony, hip-hop beats and Appalachian fiddle played on three violins, resophonic gitar, bullhorn harmonica and mariachi bass. The members of the Orchestii come from different backgrounds and scenes in New York City but share a love of the music that people all over the world listen to while drinking, dancing and weeping. Sxip Shirey is an international circus composer, Sarah Alden is an old time Appalachian fiddle player, Rima Fand is an experimental theater composer, Kaia Wong plays MOOG in an electronic band and Aaron Goldsmith has played in goth, funk and old-world music ensembles. 5th annual hands-on learning experience of the style ornamentation and repertoire of Jewish music, song and dance in workshops and masterclasses with the finest faculty from around the world. Inspirational and life enhancing for amateur and professional instrumentalists and singers. Explore the joys of Jewish song in all languages and styles, with special emphasis on Yiddish song with international and local tutors. Runs parallel with KlezFest London with joint classes in dance and ensembles. Trumpeter and vocalist Susan Watts represents the youngest generation of an exciting klezmer dynasty that reaches back to the Jewish Ukraine of the 19th century, beginning with her great grandfather, bandleader and composer, Joseph Hoffman. A fourth generation musician, Susan is the sole living purveyor of a klezmer style trumpet and sound which electrified Jewish American audiences for decades. Her engaging voice and one of a kind vocal style will carry you through a full gamut of emotions, will inspire you and "send chills up your spine". Audiences around the world are dazzled and delighted by Susan's unique virtuosity. Daughter of the great Klezmer drummer, Elaine Hoffman Watts and granddaughter of the renowned xylophonist and percussionist Jacob Hoffman, Susan is continuing her family's legacy. Her repertoire is comprised of tunes that were handed down to her by her great grandfather, grandfather and mother. This rich repertoire includes many original songs written for weddings, family members and joyous occasions. In addition to performing with a variety of noted Klezmer musicians from around the world, Susan has shared the stage with Dudu Fischer, Theodore Bikel, Claire Barry, Boban Markovic, DJ So-Called, Alicia Svigals, Margot Leverett, Henkus Netsky, among others. Susan is a member of Frank London's Klezmer Brass All-Stars, Mikveh, and The Klez Dispensers. Recently, she scored and recorded the soundtrack for the award winning film, Breath and recorded the soundtrack for a documentary on Philadelphia klezmer, A Joyful Noise. Susan teaches at klezmer festivals, is an ambassador for women's rights around the world and loves good coffee, fine vodka, singing and playing her trumpet. Balkan Beat Box will perform for their hometown fans when they stop by Joe's Pub July 13. Balkan Beat Box is spending the summer touring Europe and Israel before returning to the US for release of their eponymous debut CD September 20th on JDub Records. Blending electronic music with hard-edged folk music from the Balkans, North Africa, and the Middle East, the exciting and internationally acclaimed collective Balkan Beat Box is out to prove that all the world is, indeed, a stage -- and that we are all gypsies. A band of New Yorkers, Israelis, Africans, and Bulgarians, led by ex-Gogol Bordello member Ori Kaplan and Firewater / Big Lazy's Tamir Muskat, this group brings together folk traditions with electronic beats, video projections, and a rotating multitude of guest artists including the Bulgarian Chicks, Victoria Hannah, Jeremiah Lockwood, gnawa player Hasan Ben Nafar, Israeli MC Tomer Yosef, and more! Join Boston-based jazz pianist Gilad Barkan and his Trio with guest flutist Amir Milstein, in concert at Ryles Music Club, 212 Hampshire Street, Inman Square, Cambridge on Wednesday, July 13 beginning at 9 p.m. Tickets are $10. For more information, please call 617- 876-9330. Website: www.ryles.com. Pianist Barkan's music is rooted in jazz and combines elements of Brazilian and African rhythms. All Music Guide describes his 2003 trio release, Modulation (New Step Music) as "a powerfully impressive debut by one of Boston's finest pianistic talents." About his playing, Ferdinand Maylin wrote in Jazz Now that "Gilad has a wholesome touch and a lighthearted spirited feel." More praise comes from Seth Rogovoy in the Berkshire Eagle "Israeli-born pianist Gilad Barkan builds his improvisations from equal parts blues and Middle Eastern modes on his debut CD, and the result is a splendid example of how jazz has become an international grammar for musicians." And Michael P. Gladstone says in All About Jazz: "I'm placing this recording amongst some pretty significant trio recordings, like the early Bill Evans Trio... Zeitlin... and Mehldau..."
Barkan returns to Ryles with his trio and special guest flutist Amir Milstein for an exciting evening featuring new original compositions. 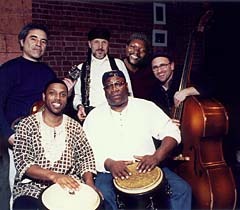 Milstein has co-led Bustan, an internationally recognized world-music ensemble that melds Eastern and Western musical traditions, and collaborated with such artists as Zakir Hussain and Tito Puente. Bassist Dan Greenpan and drummer Harvey Wirht are long-time Boston favorites. Tickets: $18/person; includes Barbeque dinner and entertainment. Concert will be held outdoors, weather permitting, at the Pearlstone Conference & Retreat Center, 5425 Gilead Road, Reisterstown MD. In the event of inclement weather, concert will be indoors. The Baltimore JCC joined forces with the Pearlstone Retreat and Conference Center in Reisterstown, Maryland to create a series of arts and culture programs. Dinner begins at 5:30; Concert at 7:00. For information and reservations, call (410) 356-5200 x324. Acclaimed Jewish, American, & Klezmer music ensemble Blending Traditional Klezmer with jazz, folk, and contemporary flavors, Lox & Vodka will take you from the shtetls of Eastern Europe to the shores of the U.S. Come sing, clap, and dance to the vibrant and spirited ethnic sounds of Jewish, American, and Klezmer music. Join us for this enchanting, festive evening! Divahn is playing at one of San Francisco's coolest clubs and we're looking forward to a really fun show! The food there is great so plan to come for dinner and have an extra nice evening. Purchase tickets: $12 in advance at www.cafedunord.com or $15 at the door. Amy Tobin (creator of The Esther Show and Lilith, the Musical) plays a short solo set at 8:30, followed by a full Divahn concert. This performance is hosted by The New Israel Fund's New Generations. Divahn's Mizrahi and Middle Eastern flavors mirror themes of the New Israel Fund's work. NIF is dedicated to building an inclusive Israel that is pluralistic and embracing of its multicultural society. New Generations represents NIF's upcoming generation of leaders and philanthropists for the advancement of social justice in Israel. They are a community of people in their 20s, 30s and 40s, and offer a diverse range of events and opportunities to get involved. Join them in their continued commitment to promote a just, democratic and thriving Israel. Singer and Composer Tami Machnai's performances invoke a powerful fusion between Western and Middle-Eastern music. She specializes in contemporary interpretations and traditional performances of Middle Eastern Israeli and Jewish folk music. She sings in Hebrew, Ladino (the Jewish dialect of Spanish) and English. Her flexible ensemble includes classical guitar, upright acoustic bass, clarinet/flute, violin, cello, piano and hand percussion. Recent credits include performing at the Fleet Center, Boston at the opening ceremony of the International JCC Maccabi Games, for an audience of twelve thousand, and performing with the L.A. Philharmonic at the new Disney Hall, in a production of Osvaldo Golijov's opera Ainadamar. In her native Israel, she has performed several times on Israeli national television and has performed in Tel Aviv at the Jazz O'mania Music Festival and the Suzanne Dalal Dance Festival. She has recorded a SONY Television commercial as soloist of the Arnon Palti Jazz Quartet, in collaboration with the Nimrod Frid Dance Ensemble, and has recorded with Boston Reggae singer/songwriter Casper John on three of his albums. She has also performed in Japan, Venezuela, and Switzerland. Now described as the "Cultural Fringe Festival" in Leeds, this unique and diverse performing arts Festival celebrates Jewish life, theatre, music and arts. Based at the Leeds Grammar School, the Festival gives the performers, writers and audience an opportunity to take part in a wide range of Jewish culture and heritage through entertainment. This year's Festival offers Drama, Comedy, and an array of music styles such as Jazz, Middle Eastern, Klezmer, Classical and World Music. Spectacular performers from all over the UK will be displaying their talents, in addition to international performers from the US, Israel, Russia and Germany. Performers include the UK's most challenging and controversial Jewish Comedian, Ivor Dembina, last years prize winners, Rose Bruford Drama College, London & Stuart Curtis's K-groove with music from their hit album "Smoked Salmon Salsa". For classical music lovers Benjamin Frith, protégée of Dame Fanny Waterman will perform with Sagi Hartov, world class Israeli Cellist. These are only a few of the amazing line-up for the Festival. Ot Azoy! This is the way to Speak, Read and Write Yiddish in a week! The 4th JMI famous Yiddish Crash course directed by Dr Khayele Beer of University College London and with expert tuition from Peysakh Fiszman of New York and Sonya Pinkusowitz of the Buber Institute in Brussels and with Yiddish Singer Shura Lipovsky from Amsterdam and with Yiddish films selected by Barry Davis. For complete beginners to intermediate plus students in four levels. Note: Rhode Island is a state to the East of Connecticut and South of Massachusetts. Not to be confused with Long Island. An evening of original compositions, conversational improvisations, jazz, world music, and poetry. The Weimar Klezmer Wochen, runs this year from July 23 through August 18 in Weimar, Germany. The Weimar workshops are for experienced musicians who enjoy learning by ear, small class sizes, and intensive focus. Most of the classes are team-taught in an atmosphere of musical and intellectual exploration. The evenings are dedicated to public jam sessions and dances in the cafes and markets of Weimar. The student body is truly international, coming from all over Europe, North America, and even Asia. For more information about the individual workshops, faculty, dates, costs, etc., please visit our website. Thanks! Learn the basics of Yiddish dance style, core dances, improvisation. Build upon morning session, learn more folk dances and time permitting, an Eastern European ballroom dance or two. Culture corner and review session. Dance Party with Light Refreshments, 7:00-10:00 p.m. $6 Evening dance party will be a model klezmer wedding- come celebrate! 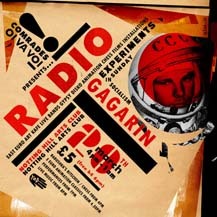 After another total roadblock, Radio Gagarin is back with the next in a series of regular Gypsy Balkan Russian Klezmer socialist shakedowns at the NHAC. The Commissar pledges exclusive new music from Oi Va Voi plus special guests, performance and djs. Co-Produced by Adrian Philpott/ Oi Va Voi / Taskovski Films / YaD Arts / Ziggurat. Sunday, July 31, 7:00 p.m.
619 Lexington Avenue at 54th Street in New York City.